We are in Holy Week, the special days between Palm Sunday and Easter, when we focus once more on those final events of Jesus’ life. These are days filled with meaning and memory that unite us with our forebears in the faith and our siblings the world over. And also, they can be deeply personal days when individually – you and I – reflect on these events and their meaning in your life and my life. This year, I am preparing to preach at two services on Resurrection Sunday. The first one will begin at sunrise in our town’s cemetery. I have gathered in this cemetery on many occasions to bury loved ones and commit them to God’s safe keeping. Easter will begin in the cemetery, and that is fitting because that is where the first Easter morning happened. Then, the second service will take place in our church’s sanctuary where people will gather with children in bright clothes, other members in pretty hats, and everyone appreciating beautiful music. This also is fitting because, while Easter began in the cemetery, it did not end there. 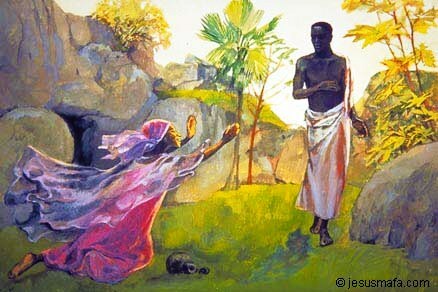 Our focal Scriptures for Easter Sunday will come from Matthew, chapter 28, and in these verses, Mary Magdalene and another disciple named Mary came to the cemetery, learned of Jesus’ resurrection, and then ran to tell Jesus’ other disciples the news. In Clarence Jordan’s Cotton Patch translation of Matthew’s gospel, he says that the women “ran like mad” to tell Jesus’ followers of his resurrection. Their running was mad in many senses of the word. I imagine them running as quickly as they could, but also I suspect they were confused, disoriented, and fearful. Still, they ran! On Easter, we gather in the cemetery – where death is close and present – and then, like the earliest disciples, we will run like mad to other places of life and hope. This entry was posted in Uncategorized on April 16, 2014 by Dean Allen.